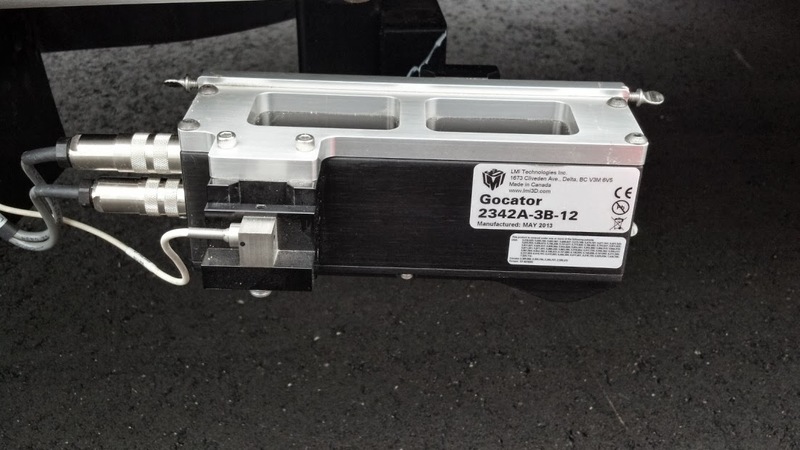 The new Gocator 3D sensors from LMI Technologies, Inc. (Delta, BC) have been officially certified for road profiling applications by several Departments of Transportation. Inertial profilers developed by Surface Systems & Instruments, Inc. (SSI, Auburn, CA and Manhattan, KS) , equipped with Gocator 2342 wide-beam lasers, have passed certification under the procedures enforced by the Wisconsin, Michigan, Illinois, Kansas and Texas Departments of Transportation. These are the first certifications of road profiling systems equipped with Gocator 3D sensors. The Gocator 2342 sensor was recently introduced as the next generation of laser line sensors for measuring pavement roughness and ride quality at highway speed, regardless of outdoor conditions and pavement geometry. SSI, a leading supplier of pavement inspection equipment for walking, light weight and high speed profiling systems, is a long term user of LMI Technologies’ 3D sensors for pavement measurement applications. 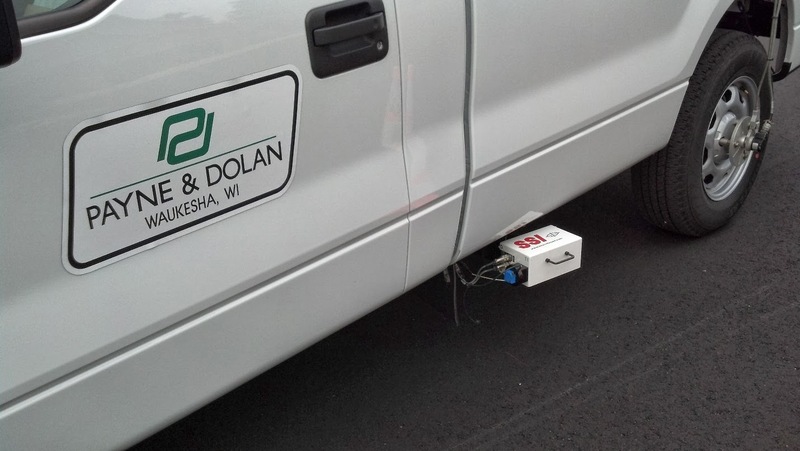 In advance of the certification process, SSI installed high speed inertial profiler instrumentation on a standard pickup truck platform. Figure 1 shows the Gocator sensor on SSI’s CS9100 mid-mount configuration. Two Gocator sensors were installed in protective enclosures (provided by SSI), with one sensor in each wheel path. SSI integrated sensor data with accelerometer information at each sensor, GPS data, and other vehicle sensors with a full suite of electronics for data acquisition, analysis and reporting. In the first certification process, the Wisconsin DOT evaluated the system on separate asphalt and concrete test sections. The evaluation process starts with a walking device to collect a neutral survey profile on each surface, which have the wheel paths well marked with paint striping to facilitate consistent tracking of the profile devices. 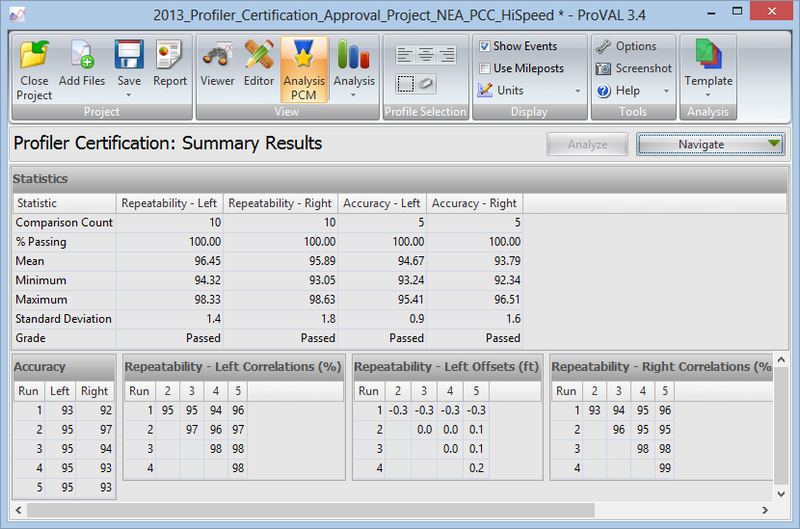 The candidate profiler then makes five runs on each surface. 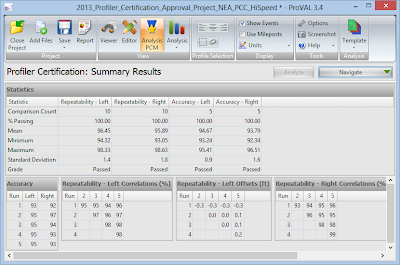 To pass the Wisconsin test, the repeated profiles from both wheel paths on each surface must correlate point-to-point at 92% for repeatability (comparing the five runs for the candidate profiler to each other) and 90% for accuracy (comparing the candidate device profiles to the neutral profile). The data is analyzed by Wisconsin DOT personnel using the “ProVAL” software program sponsored by the U.S. Federal Highway Administration. After the Gocator system test runs were collected and analyzed, the equipment was declared certified. Figure 2 shows the successful certification on the WisDOT longitudinally tined concrete test section. The new Gocator sensor is the latest technology that replaces the RoLine sensor previously used for pavement profiling applications. The RoLine sensor was introduced in 2008 at the Road Profiler User’s Group (RPUG) to provide accurate, reliable profile data on coarse textured pavements (particularly longitudinal tined and diamond ground surfaces). The RoLine sensor was developed by LMI Technologies, in collaboration with the American Concrete Pavement Association, the Michigan Concrete Pavement Association, and the University of Michigan Transportation Research Institute, to address issues of accuracy and repeatability of earlier sensors applied to measurement of coarse textured pavements. Since their introduction, RoLine sensors have proven very successful in accurately profiling all pavement surfaces. Initially the RoLine sensor was primarily used on concrete or diamond ground pavements; however more recently, asphalt pavers have found similar performance improvements, particularly on surfaces that have wider spacing between aggregate materials. Gocator sensors are LMI Technologies’ latest family of all-in-one 3D smart sensors, all based on a common platform. The platform approach allows easy implementation of enhancements and upgrades across the full product line. All Gocators feature a built-in web server GUI that connects to common web servers, in multiple languages, regardless of the end user operating system. This provides ease of setup, configuration and integration. The platform approach also provides a fully functional sensor that is easily adapted to specific application needs. The Gocator 2342 sensor for pavement profiling, Figure 3, includes all features of the previous RoLine sensors, including dynamic windowing for very high speed operation, and the same selection of sensor data outputs, including full profiles over Ethernet, bridged single value, and Selcom Serial interface as well as external synchronization. Gocator provides an easy to integrate package with the same outputs as earlier RoLine sensors to make updating profiling systems simple. Compared to RoLine sensors, Gocator 2342 features an easy to use browser based GUI, smaller package size and increased speed. Mr. Scott states that the plan is to continue to seek DOT certifications for quality assurance testing in other states. With certification, Gocator sensor equipped profilers provide repeatable and accurate profiling data for all pavement surfaces. Copyright © 2012 Surface Systems & Instruments, Inc.